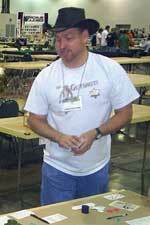 Hawgleg’s good ole buddy, Dan Frohlich, seems ta be runnin’ hawg-wild over at GenCon Indy. He’s done rounded up a posse ta get Gutshot during some Midnight Madness! “I leave Friday straight from work. I'll be running a midnight Gutshot game Saturday night in the open gaming area and maybe some more pickup games if I can get it together,” Dan said. The games are open to anyone – beginners welcome and all supplies will be provided. All you need is enough gumption to get Gutshot! Sportin' his Gutshot gear back in July at Origins. Dan will be running “Whitewash City Massacre” Saturday night at Gen Con. The game is not on the official schedule, so no tickets or sign-in are needed. Hawgleg Publishing is proud to sponsor the game and will be providing a prize for the winner of the game. If you would like to play in another game (or try to form a pick-up game), leave a note for Dan at the table with a cell phone number or other way to reach you, and he’ll try to work out a schedule to help you get Gutshot! If yer at GenCon, go to the dealer's room and mosey on over to The Last Square and tell 'em you want to get Gutshot! Karl Kruger is one heckuva nice guy and we know he'll be happy to oblige you (he's also got some right purty Western miniatures on hand, too).